Oh, our sweet beloved dogs and why do we love them so? Is it their puppy dog eyes, their loyalty or the slobbering kisses? Maybe it’s the way their lips curl up when they smile or the wagging of a happy tail. 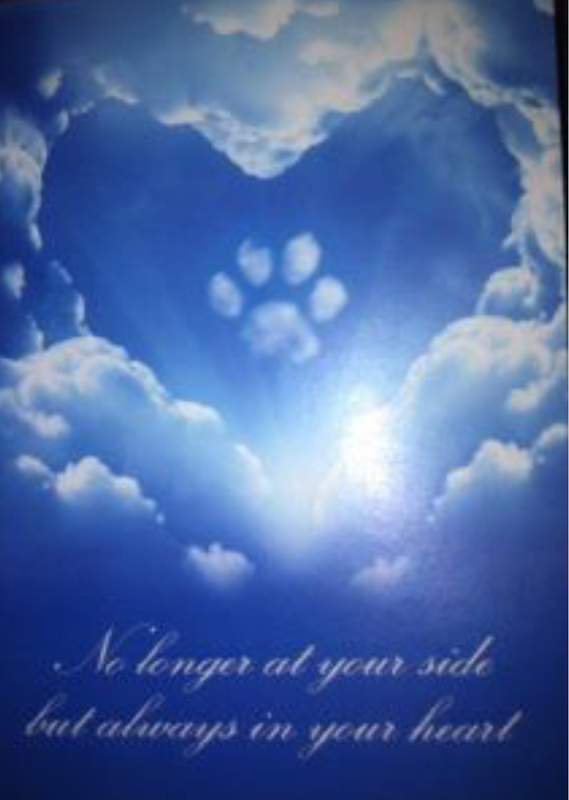 Why is it when we lose our pets it seems to hurt as much, if not more, than a family member? I’m not sure, but I am so grateful that God gave us humans such a beautiful companion, a true gift. 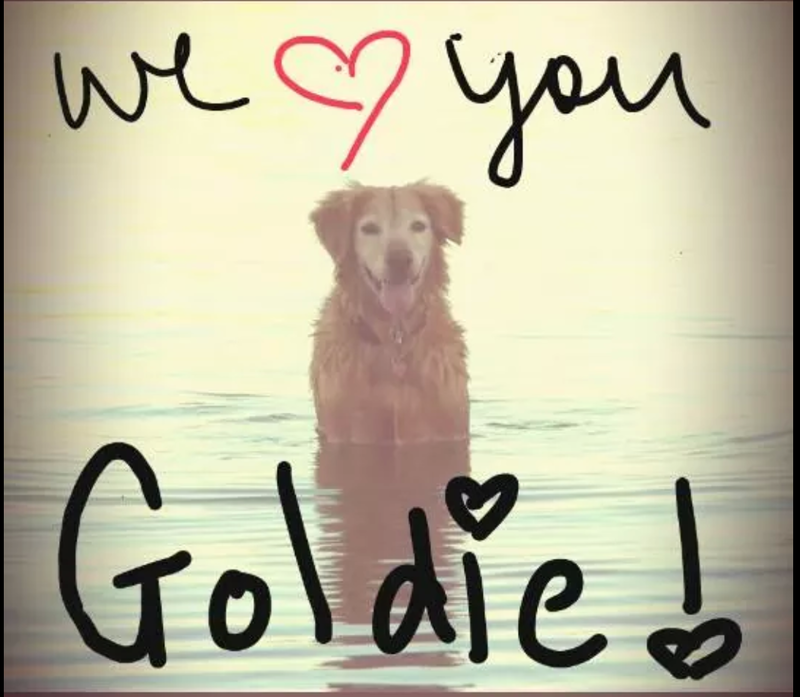 My parents lost their sweet Golden Retriever, Goldie, just four days ago. It happened pretty fast, receiving the news she had cancer just a few weeks prior. Unfortunately, there wasn’t anything they could do for her except make her comfortable, spoil her and love her to pieces. It’s still very new and tears fill my eyes thinking about it. All of our hearts were broken, my kids are taking it pretty hard because she was so special to them. They saw her several times a week, fed her, went on family vacations with her and played ball with her. They loved her as much as they love their own dog. So many questions crossed my mind. Why do we fall so in love with our pups? What is it about their loyalty and unconditional love? What lesson are they here to teach us? Do dogs really go to heaven? I started to think back to the first dog I ever fell in love with. Kelsey. She was a beautiful Golden Retriever, so smart and disciplined. She never had to be trained; she was an obedient smart dog from the start. I was in high school when we got her and I remember sitting in class longing to get home so I could hold that soft fuzzy little bear like pup. I could not wait to nuzzle my head in her neck, smell that sweet puppy smell and let her chew my fingers up with those sharp little teeth she had. It wasn’t until I became a mother myself that I realized that newborns have the same effect on me. I soon learned that babies have a scent that when a mother smells it, it causes a hit of dopamine to enter her brain. The association between the baby and feeling good becomes more and more of a desire. It’s sort of a reward for loving, snuggling and caring for her newborn, especially during those difficult first few days. Turns out that all species are the same and it not only works on the mother but any “mother” that smells it. That is why a dog may nurture a kitten. It really is amazing that God would think of such a thing! Someone said to me once that we love our dogs so much because they have a wagging tail, not a wagging tongue. Isn’t that true on so many levels? Think of the relationships we may still have if we could control our tongue. Dogs may have no choice but to hold their tongue but I don’t think they’d have anything bad to say anyway. I started to really think about their traits and really, they are not that dissimilar to that of a Christian. Maybe we are supposed to learn something from them. My dog follows me. I mean everywhere. I can walk circles around the dining room table and she will faithfully follow me. If I use the bathroom, she sticks her snout under the door. She never leaves my side unless it’s to greet a family member or friend coming into the house. I feel like this is how we should be with God. Actively and always following him. My dog also trusts me. When she is scared, she runs to me, when she is hungry, she pats the refrigerator for food. She knows I will take care of her. We should all trust that the good Lord will always take care of us. My dog loves me. Unconditionally. She curls into me, leaning her body against my legs and wagging her tail something fierce. Even if I’ve had a bad day, she never changes. Her love is similar to God’s love for me. It’s always present, unchanging and unconditional. She protects me. She protects my home and family. She’s always the first to know if someone parks in front of my house and the whole block will know it too! Just like God is my protector, always keeping me safe from harm and evil. Maybe they are here as an example of how we humans should treat other humans. Loving unconditionally, feeding and nourishing them when they are helpless to do so for themselves and giving protection to the weak. 1 Corinthians 13:4-8 says, “Love is patient, love is kind. It does not envy, it does not boast, it is not proud. It is not rude, it is not self-seeking, it is not easily angered, it keeps no records of wrongs. Love does not delight in evil but rejoices with the truth. It always protects, always trusts, always hopes, always perseveres. Love never fails. But where there are prophecies, they will cease; where there are tongues, they will be stilled; where there is knowledge, it will pass away.” I read this verse today and for the first time I saw how incredibly close this is to the personality of my pooch. Probably very similar to yours too! I know that are pets are here to teach us to love unconditionally and how to let go and heal. Although our love for them never goes away, our hearts will heal and be capable of loving again. So, go pet your doggy and give them love, they truly are a gift from heaven. This entry was posted in Christianity, Dogs, faith, family, god, grief, heaven, Life Lessons, loss, Pets, strength and tagged Christianity, dogs, family, god, grief, heaven, loss pf pet. Bookmark the permalink. I am sorrowful together with you…my only friend and companion as a child was my sweet Millie-dog…she was with me from age 4 to 14, and had at least 100 puppies over those 10 years. She had to be put down from cancer also…I got ready to go to school one day…went out and said my goodbyes and walked away dry eyed until I was out of sight of the house, whereupon I proceeded to bawl all the way to school, uncontrollably. I do believe that she will be with me in eternity, because it doesn’t make sense to me in the overall context of what I know about God and who God is…why would They allow us to get so close, so bonded, that literally for my entire life I shall mourn her…only to say sorry girl, no doggie in the window of heaven for you. Not that it is a deal breaker? But it literally seems absurd. God is not a sadist or tease. Anyway…I have been so blessed by your trust and love of God, and it has inspired me to continue to press on myself. Thanks for this post, and most of all for Loving God.